In episode three, we explore the Franciscan Framework - the WHY and the HOW of what we do at Saint Francis. Welcome back to “A Second Opinion.” I’m Maryann Reese and I have the pleasure and the privilege to serve as your President and CEO. Today I am going to be talking a little bit about the Franciscan Framework. This is the WHY of what we do at Saint Francis. It’s also the HOW. The WHY: We always start with our mission. Our mission is a ministry. 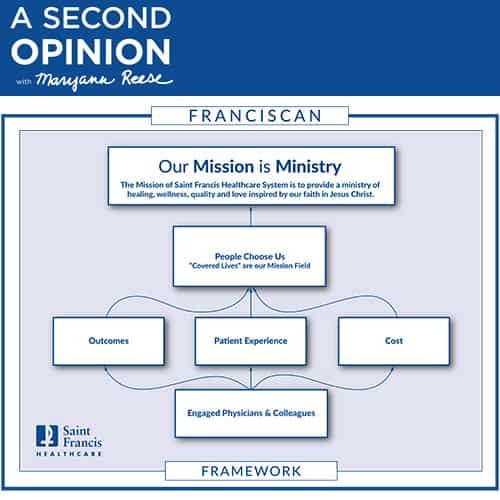 The mission of Saint Francis Healthcare System is to provide a ministry of healing, wellness, quality and love inspired by our faith in Jesus Christ. That’s really important to us. We recently renewed our mission statement. The mission is the foundation of the Franciscan framework. How this came about: the executive team, your executive team and the board thought about “what is our purpose and what is the purpose of the employees and the physicians?”. So it starts with engaged physicians and colleagues. The term “colleagues” is employees and physicians all together. It is also our vendors, our volunteers, anybody who works and shares our ministry here at Saint Francis we refer to as colleagues. So engaged physicians and colleagues. Notice I didn’t say Happy physicians and colleagues. It’s not our job to make you happy. You have to come with an innate sense of happiness when you come to work. But, it is our job to make sure that you are engaged. There are some principles – and we call them the 7 “P’s” – that we as your leadership team work on. We believe that those things are the things you care about, that instill engagement. The first one is Purpose. The purpose of the organization. This tells a little bit about the purpose of the organization. We want to make sure that we have a purpose, that we have worthwhile work, that you come to work with a sense of a ministry and purpose. The second that we think you care about is Patients. Most of you went into healthcare because you want to care for patients. Some of us have the privilege to touch patients and others of us have the privilege to care for those that touch patients. I am a nurse. I don’t get that privilege to touch patients any longer, but it is my job to help you, to help those who touch patients. Also, we think that you care about Participation. Nobody wants to come to work and just be told what to do, but we want you to participate, to make Saint Francis the best that it can be. The only way that can happen is if you are engaged and you participate in the health system. We believe that it is our job to make sure that you care about your Practice. It is our job to make sure that we make that easy; we make your practice easy. Everybody has a practice. Nurses have a practice, how they provide evidence-based care to patients. The floor technicians, the EVS (environmental services) have a practice. They have to use certain chemicals to clean the rooms. So we all have a practice. And we think you care about that. And we need to make sure that you can practice what your skills are and your competencies are. We also believe you care about your Performance. It’s our responsibility as leaders to make sure that we let you know when you are doing a great job and we let you know, not just once a year, but often if you have areas for improvement, which we all have areas for improvement along our careers. The next thing that we think is very important to you that we need to concentrate on as leaders is your Pay, making sure you have pay that is fair. The last thing, and definitely not the least important, is your Playtime, making sure that you have appropriate time off for rest and relaxation so that you can come back to work rejuvenated and ready to live out the mission and the ministry of Saint Francis. So those are the 7 “P’s.” We believe that if we, as leaders, and your Board, actually concentrate on those things, then you can do the things you’re responsible for, and that is the next level of the Franciscan Framework. These are the three. We call those the three-legged stool. All of them are very important and you as colleagues and physicians are responsible for these three. The first one is Outcomes. We want top decile performance here at Saint Francis. We are very proud of that. Our outcomes really focus on revenue cycle outcomes and also quality and safety outcomes on the patient care side. Those are the two main parts of our business. You might be sitting in orientation right now. You might be someone who admits patients. That’s on the revenue cycle side. You might be a biller. That’s the revenue cycle side. That’s how do we get our bills out and how do we collect the money that is due to us. On the patient outcomes side, is quality and safety. So you are responsible for that. I don’t to do that anymore as the CEO. But, that is your responsibility. The next one is Patient Experience. It is really important that our patients have an experience that they feel that we encounter them; that we are present with them; that we listen to them. They are really not going to know that we gave top decile performance, top decile care to them, but what they are going to know is how we made them feel. And so that patient experience is the responsibility of those that have the privilege to touch the patient and those of us who have the privilege to help those who touch patients. And the last one, but certainly not the least, is Cost. Making sure that we are aware, what we do, the care that we give and the revenue cycle processes that we have are done in a way that is the most cost-effective and efficient, not only for the health system but for our patients. If we do what we are responsible to do and you do the things we are responsible to do, then we believe that more people will choose us for their health care. This is Covered lives or our mission field. That’s what we do. We don’t have a ministry or a mission if we don’t have patients to care for. And then, if we do all of these things well, we will continue to live out the mission and ministry of Saint Francis. The reason that the Franciscan Sisters started us 142 years ago, that was to live out the mission of Saint Francis. The HOW of what we do is really this gray part that encompasses the box. That is Franciscan Formation. What does it mean to be Franciscan? That is what you will learn about as you carry on through the months and the years you work at Saint Francis. We are called to be Franciscan. If you don’t know this, our patron saint is Saint Francis. We consider him to be a caretaker. One of the things Saint Francis did, was he lived with lepers. He cared for lepers. We care for the lepers of our times as well. Those are homeless people, those are psychiatric patients, those are the patients that are difficult to care for, but we are called to care for them in a way that Saint Francis and the Sisters before us would be proud. So that’s the Franciscan Framework. It’s the WHY we do what we do at Saint Francis. It’s also the HOW. There is something that I want you to always remember. It’s hard to get a job at Saint Francis. Thank you for choosing us. Thank you for wanting to work here. But always remember that we chose you, because we saw something in you that aligns with our mission and our vision and our values. It aligns with our Franciscan Framework. Always remember that. Until next time, this is “A Second Opinion” with me, Maryann. Adios.